If your hard drive is kaput, or if it just doesn't have adequate storage space, it might be time to replace it. All you'll need is a Phillips-head screwdriver and, of course, a replacement hard drive. Here's how to do it. Fully shut down your computer, disconnect the AC adapter, and remove the battery pack. To remove the battery pack, slide the latch on the battery pack cover to open it, then pull the battery out by its tab. If you have a secondary battery in the multimedia pocket, remove that one as well. It is very important to make sure that the unit is completely unpowered before you continue. Step two: remove the encased hard drive. If your screen is closed, open it. On the right side of the palm rest, a few inches below the right arrow key, there's a latch with a little oval button in the middle. Hold the button down and slide the latch forward to pop open the hard drive cover. Pull the tab to slide out the hard drive. Step three: take the hard drive out of its caddy. You'll find one screw on the tabbed end of the hard drive caddy and three on the opposite end. Unscrew all of them, then carefully open the caddy. Inside you'll find a lot of foam, pieces of copper, a heater (the metalic, labyrinthine thing wrapped around the hard drive) and a ribbon connector. Don't be intimidated. It's not much more difficult to open than a pack of playing cards. Underneath the ribbon connector you'll find a plastic flap secured by a couple pieces of tape. Gently open it up. 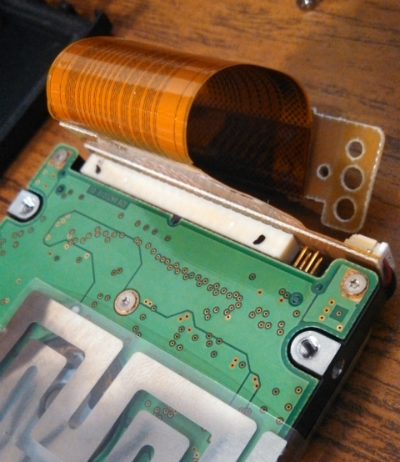 The hard drive, heater and ribbon connector should slide out easily in one piece. If they don't, then there's probably some kind of adhesive in the bottom of the plastic case. In such an event you'll have to wiggle it loose. Untape the heater and unplug the ribbon connector. Your old hard drive should now be free. Put it aside. You are done with it. Step four: put your new hard drive into the caddy. Take out your new hard drive. Plug the ribbon into the pin connector. There should be four extra pins on the right (and none on the left). If there are six extra pins, that means you plugged it in backwards. Secure the heater around the new hard drive with the tape, just as it was attached to the old one. Carefully slide the hard drive back into the plastic case and re-stick the flap over the ribbon connector. If you can't close the flap, make sure that you didn't slid the hard drive in backwards. Slide the two halves of the caddy together and screw the screws back in. Slide the hard drive back into the computer until it is firmly in place. Close and latch the cover. Do the same with the battery. Power up your computer and check if the hard drive is recognized. If it isn't, power down your computer again, take the battery out again, remove the hard drive, put the hard drive back in, put the battery back in, and boot up your computer again.